Occasionally a recipe that I pass over when selecting what to make for this blog will somehow get stuck in my memory, and I keep getting pulled back to it. The recipe I’m sharing today for Cottage Cheese Pie is one of those recipes. I first saw this recipe for Cottage Cheese Pie in a hundred-year-year-old magazine almost a year ago, and made an image of it. But it sounded just different enough that I didn’t actually make it at the time. Every time I cleaned up my blog material files, I’d see this recipe again and wonder, “What does Cottage Cheese Pie taste like?” –and I couldn’t quite bring myself to discard the recipe. Well, a few days ago I finally made Cottage Cheese Pie and I now know what it tastes like. The rich cottage cheese custard contains dried currants and just a hint of lemon. Even though I’ve never eaten Cottage Cheese Pie before, it immediately fell into the comfort food category for me. It is not very sweet–and could be eaten either for lunch or as a dessert. And, a half hour later I wanted to eat another slice (and had to struggle to convince myself that I really should wait until dinner to eat any more of the pie). Preheat oven to 425° F. Put the cottage cheese, eggs, milk, sour cream, sugar, lemon extract, flour, and salt in a mixing bowl; mix until combined. Stir in the currants, and put the mixture in the pie shell. Bake 15 minutes; then reduce heat to 350°. Continue baking (about 30-40 minutes) until a knife inserted in the center of the pie comes out clean. Posted on February 19, 2017 April 5, 2019 by SherylPosted in FoodTagged cottage cheese, pie. I can believe that this is good! I probably would like it better than cheesecake,while I like a bit or two of cheesecake ,it’s so rich that I soon find myself pushing the plate away. I really enjoy these hundred year old recipes! It’s wonderful to hear that you enjoy these old recipes. I have a lot of fun finding and trying them. Well this does sound different and would love to try it! Liked the way you described your taste reactions growing from tentative to yum! I had a hard time figuring out how to write this post. It’s nice to hear that my description of the recipe worked for you. I’ve never had an Italian ricotta pie, but I’m intrigued. It sounds good. Looks interesting and something I would try. And also wonder if it would be good tasting. It’s a little different from most modern pies, but quite good. I think you’d enjoy it. I read through the ingredients and wondered if it was a dessert or not. You gave a good description of the taste. I think it would be good at a ladies’ luncheon. It would be excellent for a luncheon. This is very like curd tart, an old Yorkshire speciality made from the young curds strained from soured milk. as an alternative to using them for cheese making. 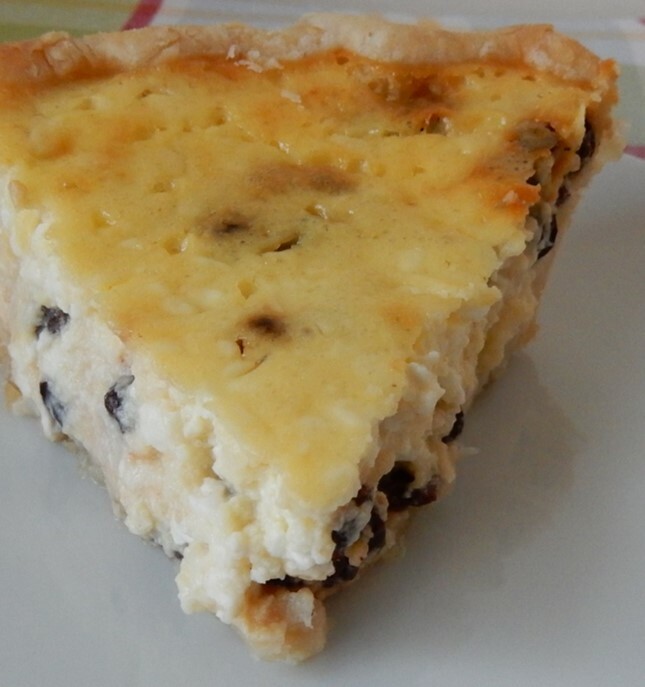 Your comment sent me googling “curd tart.” This recipe does looks very similar to curd tart. Maybe this is how a cook in days gone by adapted a curd tart recipe. Sounds very interesting and after your description I really want to taste it! There are so many overly sweet desserts. It’s always nice to find a recipe that lets the other flavors shine through without be overwhelmed by the sweetness. For years, I’ve made a kind of false quiche using cottage cheese, broccoli, onion, and eggs. It’s wonderful, and suggests that this would be wonderful, too. I’m going to give it a try. I think that you’ll enjoy this recipe. Your “false quiche” sounds delicious. It kind of reminded me of a clabber milk chess pie my grandmother used to make. I’m intrigued by the idea of “clabbering” milk. Back in the days before pasteurization there were lots of recipes that called for sour milk as well as clabber milk. I can see why this recipe kept pulling you back. It both looks and sounds intriguing! I’m glad that I decided to give it a try. I’m sure my husband would love this pie. I must make it for him. If you make it, I’d love to hear how it turned out. With these old recipes, other readers always find it really helpful to read about others experiences. Lighter than cheesecake? That’s my kind of recipe. Glad you didn’t keep ignoring it. This recipe makes me want to try a couple of the other hundred-year-old recipes that have been languishing in my files for one reason or another. I’m glad you liked the description. If you make this recipe, I’d love to hear what you think of it. I grew up eating curd cake, and the recipe is nearly identical! So yummy! My family came from Yorkshire, so it’s likely the same as the curd pie mentioned above. I wonder if some immigrant from England remembered curd cake, and adapted it to “invent” Cottage Cheese Pie. It’s a little different from anything else that I’ve eaten, but it was good – and I definitely think that I’ll make it again. It actually sounds good except for the currents. I’ve never had them and have a prejudice against them. What do they taste like? Please don’t say raisins. Oh, that is a great plug for currants! Maybe I will try them. Sounds like I should try this, even though my reaction is sort of like yours. Give it a try and see what you think. Some of these old recipes are very interesting – and different from modern recipes – but good in their own way. If you don’t like cottage cheese this may not be the recipe for you. Wow, what an interesting concept for a blog! I’ve never heard of cottage cheese pie, but I love cottage cheese, and I love it paired with sweet things, so maybe this is for me. I haven’t made one in a long time. You are right they are good. My recipe is in a 1940 Time Mag. cook book with nothing but pies. It is a little cookbook but interesting. Thanks for sharing. Your pie cookbook sounds like a fun cookbook. 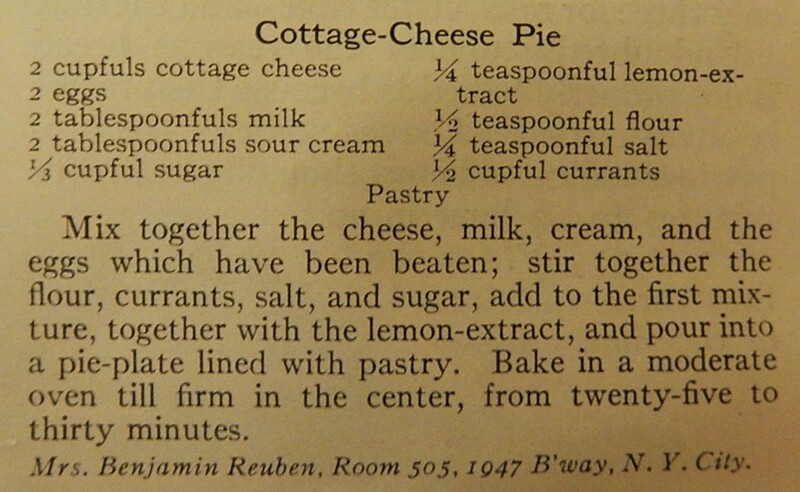 It’s interesting to know that Cottage Cheese Pies were in cookbooks at least up until mid-century. I wonder why they fell out of favor. Cottage cheese kuchen is very popular with the Germans from Russia. It’s not my favorite because of the filling texture. Most GR’s today use regular drained cottage cheese but years ago they used the fine-grained homemade kind. That always seemed gritty to me. Good post! Now you’ve made me curious. Do you happen to know if the homemade cottage cheese you had years ago was made with pasteurized milk? I’ve seen recipes in old cookbooks for making homemade cottage cheese, but never tried them because I thought that they might require raw milk. Raw cow’s milk was used years ago to make cottage cheese. Nowadays, dry cottage cheese is hard to locate in stores, so regular store-purchased cottage cheese is used for various German-Russian dishes including cottage cheese kuchen. Just remember to drain the cottage cheese good. Dry cottage cheese can be mailed ordered from http://www.westbycreamery.com in Wisconsin. I sometimes find it in Italian and Mexican grocery stores. Farmer’s cheese isn’t the same thing. If you google, you will find sites with pics that walk you through the cottage cheese-making process. They will give you a clearer description of the preferred milk to use. I believe it should be unpasteurized. This is really interesting. Thanks for the information. I hadn’t realized that there were two types of cottage cheese. I’m almost sure that I’ve never seen the dry variety. I’m going to have to look for it now. It is a nice change from the typical pie. It’s nice to hear that you enjoyed this post. I think that you’d like it. It’s a very nice pie. It sounds good to me. We have a house full of lactose intolerant people and also one with celiac. I’m wondering how it would work with lactose free cottage cheese and milk and gluten free flour. I love your taste descriptions. Hmm. . . I have no idea. If you make a lactose/gluten free version, you’ll have to let us know how it turns out. Other readers always find it really helpful to hear about others experiences with these recipes. My husband loves cottage cheese so he’d probably really love this pie. I may have to make it just to see! If you make it, you’ll have to let us know what he thinks of it. A lovely dessert! Thanks for sharing! Yum! I am sort of obsessed with cottage cheese. This is quite similar to a ricotta tart but I suppose it has a lot more tang with the cottage cheese and sour cream? hmm. . . I’ve never had a ricotta tart, so I’m not sure. That said, the Cottage Cheese PIe isn’t particularly tangy. It has enough sugar to minimize the tang, but it’s not very sweet. Now you have got me going – my mum had a very similar recipe and I have not made it for years – you describe the experience of eating it perfectly! It is an insidious beast – not quite quiche , not really cheesecake, neither savoury nor sweet exactly – and definitely more-ish! I am into cooking dessert with our cool weather – Australia – so I off to find mum’s recipe and compare it to yours – thank you so much for returning to this!